In the past week or so, I had to jump back to the AI in order to implement key gameplay mechanics, namely the contraband check and the arrest warrant. The contraband check (as it was in 2400AD) is a Robot approaching the Player, seemingly randomly, and conducting a spot-check whether the Player is carrying any items. The arrest warrant — not in 2400AD — is similar in concept, but that it checks whether you have accrued too many demerits and therefore will be accosted and told to submit to imprisonment. These two mechanics required AI to be improved. When I look back at Zak’s AI graph, I realise that the scope was very limited to moving, which was all I wanted from it at the time. But I required a Robot to determine a Player’s total demerits, or decide on conducting a contraband check based on a controllable game mechanic formula, it was apparent that I needed to expand the AI graph’s ability to call in-game functions where those computations could be made. The image below shows an example. The blue circles are dofunc directives. Let’s take dofunc IsCheckCooldown as the example. Contraband checks should not occur too often, so a cooldown threshold is implemented. That function’s purpose is to check whether a contraband check cooldown threshold has been met. The in-game function looks like this. It returns either “0” or “1” (strings), and that forms a GlobalEventHandler name of onfunc IsCheckCooldown 0 or onfunc IsCheckCooldown 1 depending on the result. In the top image, you can see that a function called RollForCheck does the same thing. So that’s one application of the functions. The other application is one that sets variables. In the previous AI version, variables were set using the var directive. But what was needed was for functions to set variables as dictated by the AI. So here’s an example of that. When a Checker Robot is attacked, it doesn’t fight back because it doesn’t have weapons. So it runs away. It tries to find a location that is out of sight of your weapon. I created a function called CheckerFindNearestHiddenTile. See the left blue circle below. Note that I use hiddentile as the <arg> parameter (the 3rd keyword). One difference here is that I don’t use the GlobalEventHandler as a way to get the variable. Instead, the function uses the <arg>, which is "hiddentile" as the base name of the variables to set in the AI’s memory. In the function above, I set an X and Y variable using "hiddentile" as my base name, and back in the AI graph, I use it to determine the coordinates for the Robot’s movement. I also use functions to do what would normally be tedious to do if I didn’t have the AI as the framework. For example, I am able to call a function dofunc CheckerSayAttacked, which brings up a speech bubble above the Robot saying its being attacked. The function capability now attached to the AI’s framework allows graphs to be re-used across different Robots, so that the same function can be used on another kind of Robot. Functions are also used to raise the alert level on a global scope, they are used to bring up the Convo system so when the Robot comes close to the Player, and if the Robot intends to accost the Player, the Convo system comes up with the appropriate topic entry. So far, the fanciest function I’ve done was a predictive search for the Player when the Robot has lost LOS of the Player. The power of engine is the limit, whatever the engine is. And because this AI is agnostic, I hope to be able to port this functionality in Unity when the time comes around to do it. The video below shows a sample of the AI in action. The Player has accumulated enough demerits that the Checker will accost him. If the Player decides not to submit to detention, the Checker runs away, and the Minder (the other Robot) engages the Player in combat. One of the significant progress milestones I’ve done since the beginning of March was the implementation of a system I call Convo and a rudimentary NPC AI that allows NPCs to move/wander and do things randomly, if their base purpose allows it. To achieve the implementation, two fundamental concepts had to be developed. The first is SNTX, and the second is the usage of the TGF to express nodal networks that are are interpreted at runtime. SNTX is a procedural markup language designed to be injected into dicts. The resulting dict keys are procedurally looked-up to get to a resulting value. SNTX is a significant upgrade to the TalkDialogue system that I developed in 2015. The difference lies in the robustness of handling Conditions, as well as clarity. 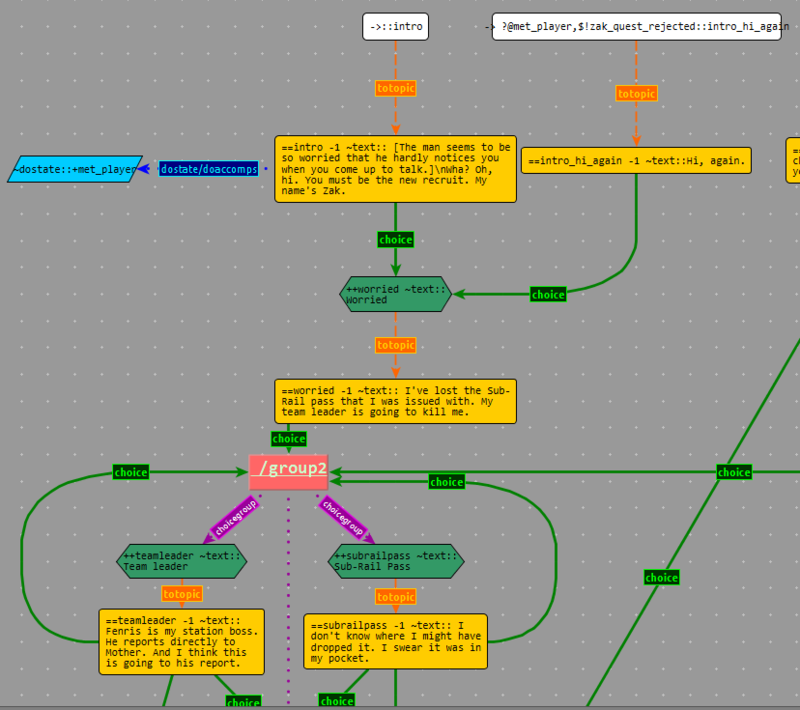 The idea behind the TalkDialogue and SNTX markups was the ability to author a dialogue tree using a text file. 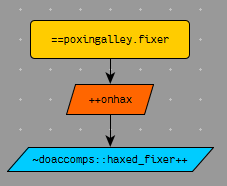 By and large this has been possible, but the branching nature of dialogue trees makes writing everything down in one linear text file still confusing. 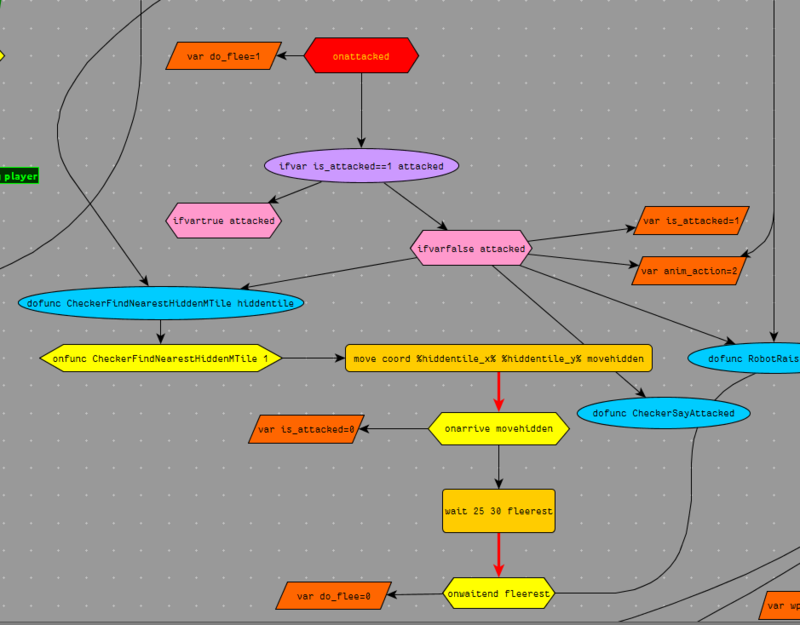 It was this reason that I looked to yEd in order to visualise the dialogue tree . One of the important aspects of SNTX is the concept of Conditions. Conditions are simply asking: is this node valid? If a node has a Condition, the Condition must be True in order for the node to be processed by the system. Accomps – a global dict that represent arbitrary ‘accomplishments’. INV – the Player’s Inventory can be searched for a particular item, for a particular quantity. The other side of Conditions are Doers. Doers set Accomps or an NPC’s State. Within the Convo (and Astrip) systems, a node is capable of executing a command telling to either add/remove/modify a key in the Accomps, or amend an NPC’s State. It also allows transferring of items from NPC to Player, and vice-versa. With Doers and Conditions combined, it allows me to script an interactive storyline. In fact, I have completed a sample quest using all these systems as an early-stage trial for the prototype. I’m happy to say that it also involves having to kill a Robot. 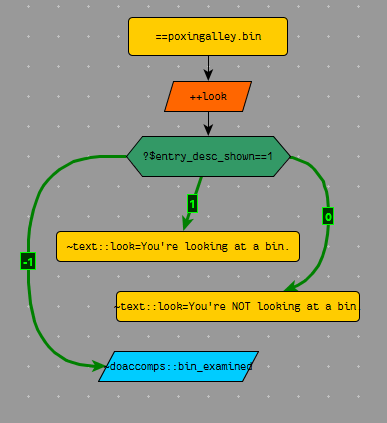 yEd is a very capable diagramming application. It has become my weapon of choice because it is one of the very few programs that allow TGF export. TGF (Trivial Graph Format) is a super-lightweight nodal graph format that, when coupled with a well-thought-out markup, can solve a large number of data relationship issues. 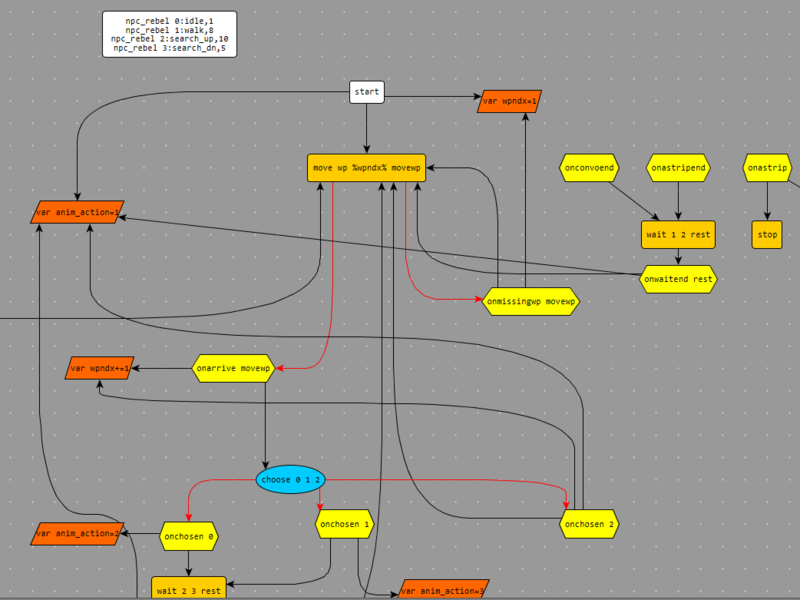 My usage of yEd and TGFs began with simply creating nodes that were labeled as SNTX keys. I drew edges that served as annotations to their relationships, though they didn’t actually define the relationship. That is, except for Choices: for every Topic a line can be drawn to a Choice, which will then be recognised by the TGF2Convo converter tool (explained later). A Convo graph. ‘choice’-labelled edges are the only edges that are processed in the TGF. 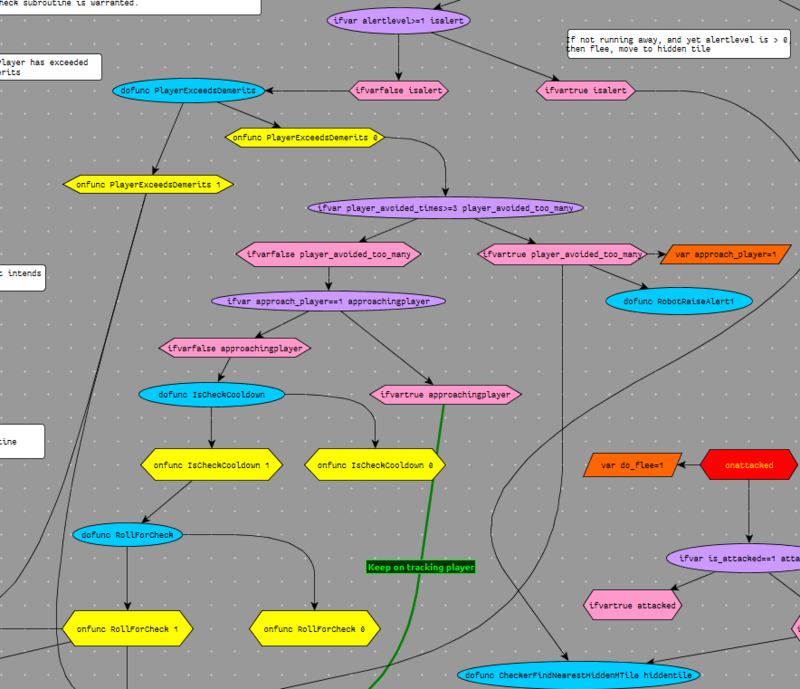 The above image shows Topics (yellow), Choices (green), Doers (cyan), ChoiceGroups (pink), Entry (white). 4 ==intro -1 ~text:: [The man seems to be so worried that he hardly notices you when you come up to talk.]\nWha? Oh, hi. You must be the new recruit. My name's Zak. 9 ==intro_hi_again -1 ~text::Hi, again. 10 ==worried -1 ~text:: I've lost the Sub- Rail pass that I was issued with. My team leader is going to kill me. 12 ==subrailpass -1 ~text:: I don't know where I might have dropped it. I swear it was in my pocket. ==intro -1 ~text::[The man seems to be so worried that he hardly notices you when you come up to talk.]\nWha? Oh, hi. You must be the new recruit. My name's Zak. The TGF2Convo tool uses Markdown syntax so that when a Markdown viewer is used, it is easier to understand. Ultimately, the dict is populated with these values, and the runtime uses the dict to determine the path of the dialogue. However, this is not my ideal way. I had developed SNTX ahead of using TGF. Since using TGF with AI, I realised that utilising TGF fully would be a better way to go for dialogues, but this requires a re-working of the Convo system. This might be done at the end of the prototype phase. After the Convo system and SNTX were developed, I had to jump into AI. At that point I had two choices: I could go and write the AI in C2 as events, or I could attempt something much harder, ultimately more flexible, and platform-agnostic. I chose the latter. When looking at what I wanted to do with the AI, I decided that I just needed a very simple system of controlling the actions and movements of NPCs (not the enemy NPCs). I outlined the requirements of what it would take for an NPC (Zak) who has lost something and is wandering around a given area. First, there is the point of movement. The NPC should be able to use waypoints. Second, the NPC should have some random ability to use waypoints. Third, the NPC should have some random wait times. Fourth, the NPC should have random animation. When I started developing the AI, I would click on Zak to talk to him. A ‘Talk’ icon would appear, but Zak kept on moving. Though I could have effectively paused the game so that I could properly select the icon before Zak walked away, I thought it would be better to tell the AI to stop Zak. That’s when event handlers came into the picture, which also brought forth a host of different possibilities. For example, I created an event handler called onastrip, which is called when you try to initiate an interaction. In the AI graph, this event handler is connected to make Zak stop. If the icons are ‘aborted’, the event onastripend is fired, and the AI graph is wired to make Zak resume where he left off. When a Convo is initiatedonconvo is fired, and this stops him, too. When Convo is ended, onconvoend is fired. If a waypoint is missing, there is a wpmissing event that fires, which allows the AI to adjust itself in order to get a proper waypoint index. The idea of ‘events handlers’ also gradually slid into the other aspects of the AI graph, where ‘events’ are triggered as a result of an operation (a Doer). For example, a choose node chooses between one of any number of events to fire. As long as that event handler is present, then it is a valid event. Example of a `choose` node. `0`, `1`, and `2` are not really numbers; they are event names and when `choose` chooses an event the handler should be named `onchosen <event_name>`. There is an immense satisfaction in working this way. There’s definitely a lot more work involved, but it brings the systems I’m working on at a higher level of flexibility, while at the same time, it’s still within the realm of my understanding since I’m the one developing it. Although I don’t know how much of the AI, in particular, will make it through the Unity alpha, it is undoubtedly a very useful piece of development because it informs me of the kinds of behaviours I may need to do; which aspects to simplify, and which aspects need more complex behaviours.